Twitter hashtags are the best way to connect with people in your discipline! When you type out a tweet, be sure to include the subject you are talking about along with the #MTBoS hashtag. The hashtags are listed below. Twitter Chats are one hour weekly chats held on Twitter. And they aren’t just chats that happen once a week, they are hashtags you can use anytime you tweet to connect with other teachers in your subject area! There are many different types of Twitter Chats, from general education chats to book chats. And there are math subject chats for everything from Elementary School Math to Calculus! Below are some of the most common math subject area Twitter Chats. Don’t be intimidated if you are a newcomer, you don’t even have to type anything to participate – you can just listen! But I promise that you will be compelled to jump in! Read below for more helpful hints! Just click on the link to see the chat! Some live chats may no longer be active, but educators often use the hashtags to connect! 200+ different education chats are listed here!! Thanks to @cybraryman1, @conniehamilton, @thomascmurray, @cevans5095 and @jrochelle for compiling this comprehensive list! Don’t feel you have to read every tweet. If you have never participated in a Twitter chat before you are in for a treat! To participate, you just need to include the hashtag (example: #msMathChat) in your 140 characters. Don’t feel intimidated, because you don’t actually have to “chat” if you do not want to. You can simply log into twitter and watch the conversations. To do this, follow the hashtag. To follow a hashtag, simply perform a search on Twitter. 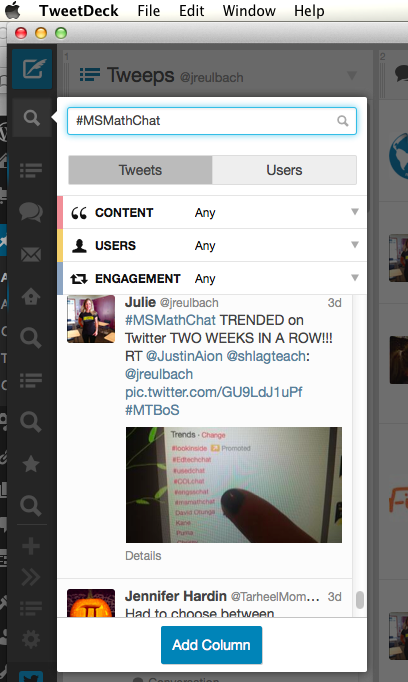 If your Twitter account is private, you may want to unlock your tweets during the math chat. This will allow people who do not follow you to read your chats for the hour. More Helpful Twitter Hints: TweetDeck! Twitter can confusing and even overwhelming at first. A BIG TIP for making Twitter truly awesome is TweetDeck by Twitter! TweetDeck is great because you can see you entire Timeline (all of the tweets from all of people you follow – this is what you see on the Twitter.com page online or on your smartphone), Notifications (people who are talking to you or including you in a conversation publicly), Messages (people who are talking privately just to you), and then any cool things you want to keep up with (like #msMathChat or #MTBoS). TweetDeck puts all of hashtags you want to follow in separate COLUMNS. It is ALL viewable in one place at the same time and looks like this… If you perform a search, you can then create a whole new column from your hashtag search. Notice the nifty little blue Add Column button at the bottom? Yep, it’s true love.